Come join us!! There will be a live performance by the band “Her Brothers.” They are an alternative rock band who are standing up for women and girls by spreading their message through their music. Described as “high energy rock with an intense longing for meaning. You are invited to join us for our fourth annual "Every Girl Matters Day," on Oct 11, 2016. The British Colombian government has officially proclaimed this day as Every Girl Matters in conjunction with the United Nations "Day of the Girl." A day to recognize the global rights of girls around the world. 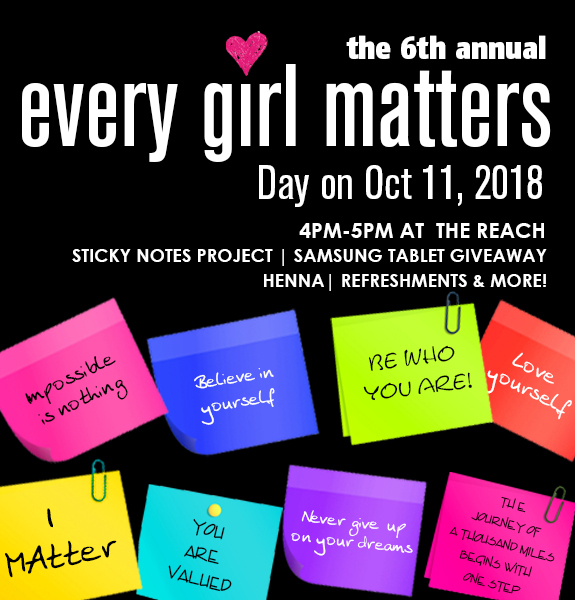 Come take part in our Every Girl Matters Video Campaign! You are invited to make a difference by having your say as to: WHY EVERY GIRL MATTERS? We will be shooting on location asking the public this very question. This is a way for you to take part in a bigger montage of voices that are working for change and helping to create a better world where girls’ rights matter. There will be a special live performance by the talented & poetic: Saint Solider. Join us as we empower, educate, inspire and work in solidarity for change within our community. Our community art project includes our Handmade with Love Project. Take part in our art project where you can literally get your hands involved as we welcome you to help us create a tapestry of hand painted art with heartfelt messages on our social banner. Coffee and cake will be served, this is FREE COMMUNITY EVENT. This event is brought to you by the partnership between GirlKIND and The Reach and Sipp Chai.